Is getting out into nature daily a challenge? 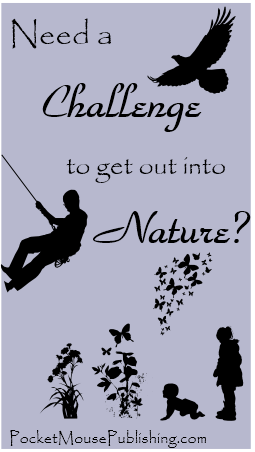 Or do you need a challenge to get out daily into nature? Tomorrow is May 1. Nothing like a new month to take on a new challenge. And MAYbe this is your month. May is spring in the northern hemisphere and autumn in the southern hemisphere — not too hot, not too cold, just right for getting outside and getting a daily dose of nature time! But…maybe you’re feeling too busy. Or maybe you’ve had a nature walk go wrong. Or maybe you can’t seem to remember a single benefit to time outdoors when the kids beg for just 30 more minutes in Minecraft. Or is that only at my house? 1. Starting May 1, the David Suzuki Foundation has a 30×30 challenge. That’s 30 minutes outdoors for 30 days. Do you have 30 minutes? Just 30 out of 1440 a day — about 2% of your time. 2. Want something less time-bound? Wilder Child offers a chart called 100 Trees, 100 Chances in the fantastic article 6 Ways to Get Your Kids Outside (When They Don’t Want to Go). Color a tree every time you go outdoors and watch your forest grow! 3. Is a purposeful, structured time more your style? Back in 2008, the Handbook of Nature Study Outdoor Hour Challenge began — and is still going. Years of challenges to get you started and keep you outside! Do you know of another challenge that encourages getting outside regularly? Share it in the comments! Or tweet to @pocketmousepub and let us know! And after you’ve been outside, check out the Nature Chills Challenge to share what you’ve discovered! I just read a 2010 study that found kids ages 8-18 spent 7 hours and 38 minutes in front of a screen daily, about 27% of their day. Has technology use gone up or down at your house in the last 5 years? Thanks so much for including Wilder Child in this post! I love the idea of challenges – they always motivate me. 1000 Hours Outside (http://1000hoursoutside.com/) has issued a great challenge to track time. And Dr. Scott Sampson has his own 30X3 challenge (http://raiseawildchild.com/). Ok, time to go outside! I didn’t know about the 30×3 challenge — if we don’t hit 30×30, we’ll at least hit 30×3! I’ve been to 1000HoursOutside, but I’m not quite ready to commit to that (yet!). Thanks again for the 100 Trees chart!! What a great challenge! How about taking it? And yes, how about telling about your adventures in a post, tagging it with ‘Nature Chills Challenge3’ and linking it to my blog? Thanks for reblogging! After we’ve had an adventure or two, I will share! What a great idea! Get outside! Enjoy nature! I need to get outside more and the 30 x 30 Challenge looks like a good fit for me. Thanks for posting. Do your Happy Friday Dance outside today! Thanks for stopping by PMP! I do walk every day for at least an hour. Going to buy a new kayak now that I have found a place here to kayak (absolutely the best, most calming thing to do or I could be biased). I mean quiet lake or river type kayaking not whitewater. I was looking for hiking trails around here and was amazed and how there is little to no info but determined to find some new trails. If I am not in the wheelchair or walker I am a walking…. MAY you find a wonderful new trail this month, and a new kayak! I love discovering new places with my kids. I’m up for a challenge. This sounds like it will fit in perfectly with my promise to myself to pick up running again. And maybe some bike riding 🙂 In fact, I am throwing on my sports bra and I’m off right now!